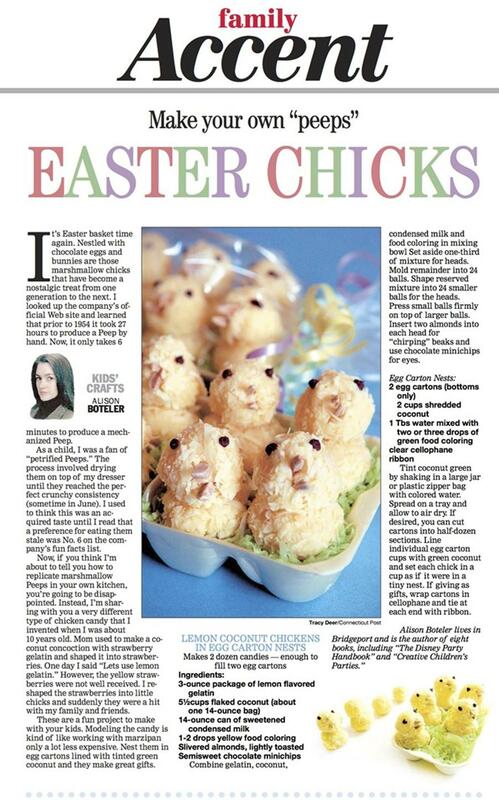 You must wonder… “What is she talking about?” Easter is considered “early” when it’s the Sunday after St Patrick’s Day. This year it’s the first weekend in April, not exactly late just somewhere in between. Well this year I have a brother coming up from Washington DC and cousins from Florida and New York so in order to see everyone at the same time, we are having Easter dinner this year on a Saturday night. It’s amazing to me how just having one less weekend day to prepare makes it seem like crunch time for the cook. I always motivate myself by setting the table first. Something about getting all of that under control gives me a false sense of security that everything is under control. When you think about it, that actually translates into a very real sense of pre-party calm. 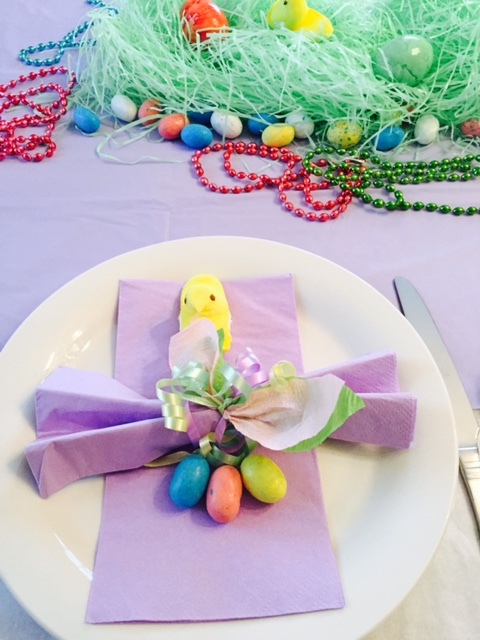 I made a large nest of easter grass in the middle of the lavender dining room table runner and decorated with malted milk eggs, dyed hard cooked eggs and, of course, PEEPS. 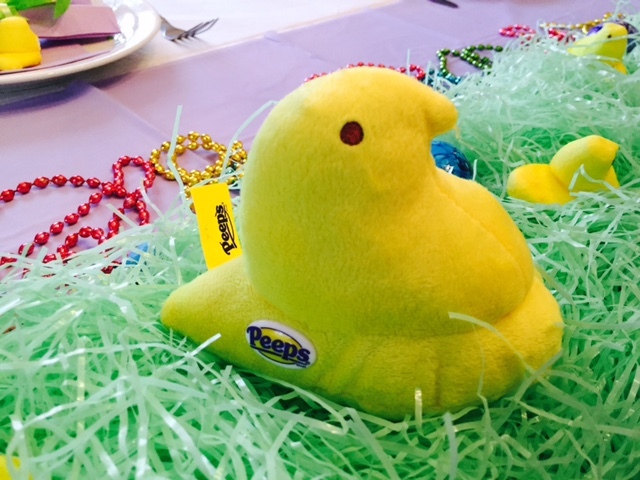 (I even have a big stuffed PEEP as a centerpiece). 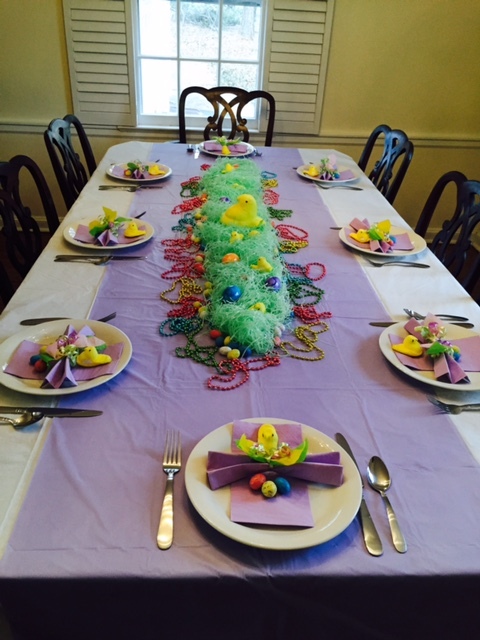 I also had a lot of pastel Mardi Gras beads in storage so I decided they blended well with the Easter theme. This will turn a golden brown after baking in the oven for half an hour. 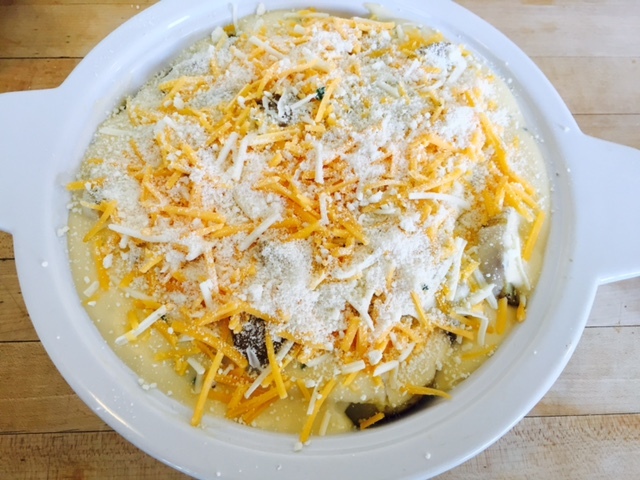 Next I made my Yukon Gold baked potato casserole with a chive cheese sauce. 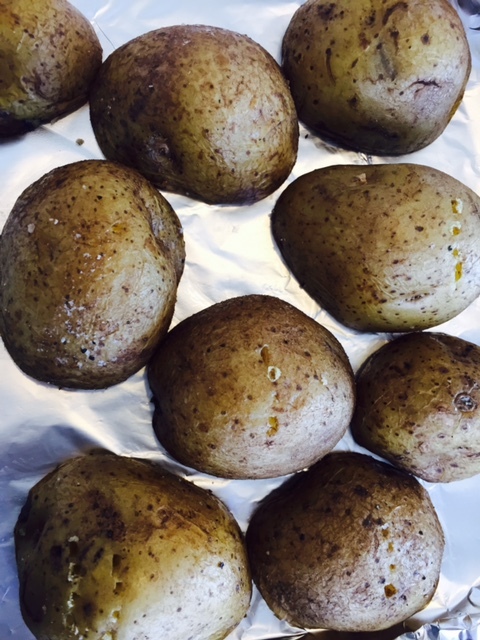 First I sliced the potatoes in half and roasted them on an oiled baking sheet. 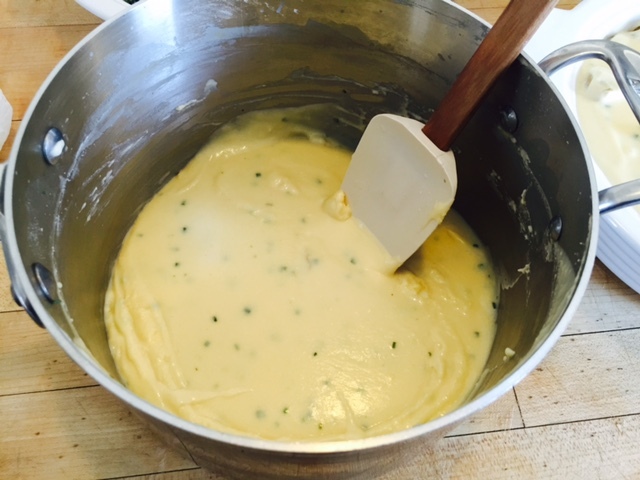 Then I made a bechemel sauce with a blend of cheddar and Swiss cheese and chives. 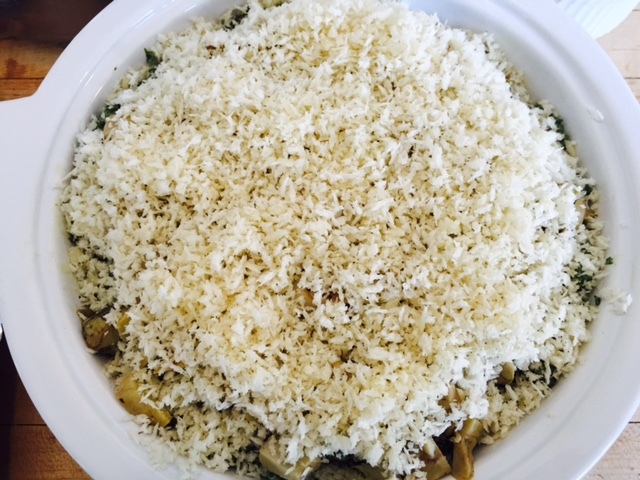 I sliced the roasted potatoes, covered them in the cheese sauce and topped with more grated cheese. 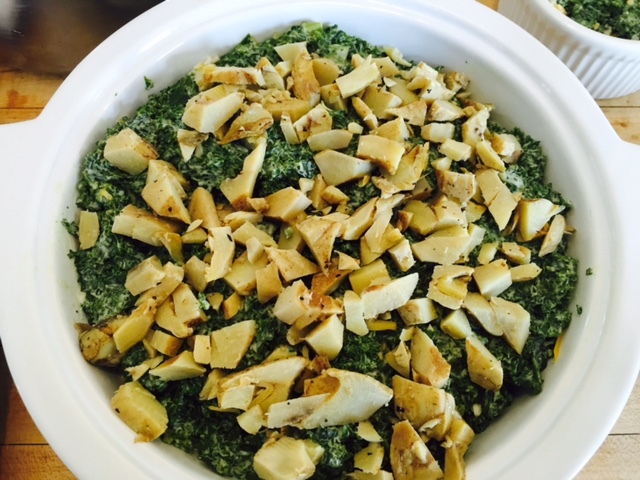 Just like the kale casserole, it will reach it’s full glory when baked to a golden brown. Right now both are wrapped up in the fridge waiting for Saturday night. 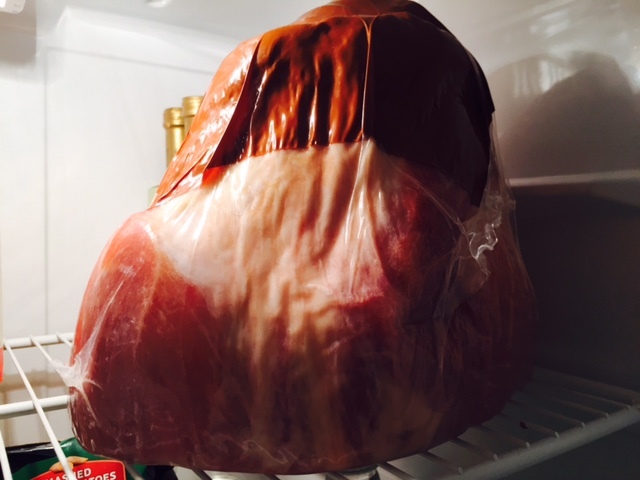 Then comes the ham. It’s also waiting in the fridge to be baked by my friend and neighbor to free up my oven at the last minute. 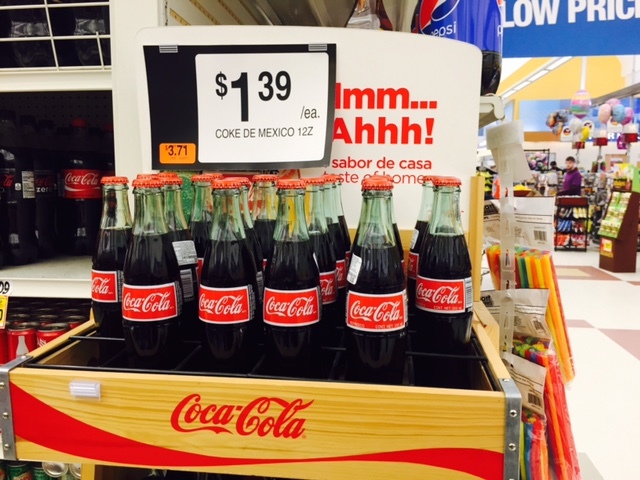 This year I saw a display for Mexican Coca Cola in a glass bottles so I decided we should try glazing it with Caco Cola the way my Aunt Liz from New Orleans used to do. And of course there’s the cherry sauce. 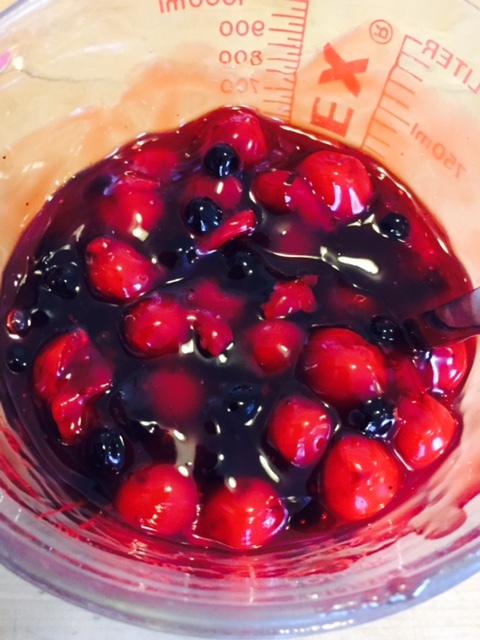 I sometimes find it a little mundane so I spiked it up with pomegranate-blueberry vinegar and dried blueberries. 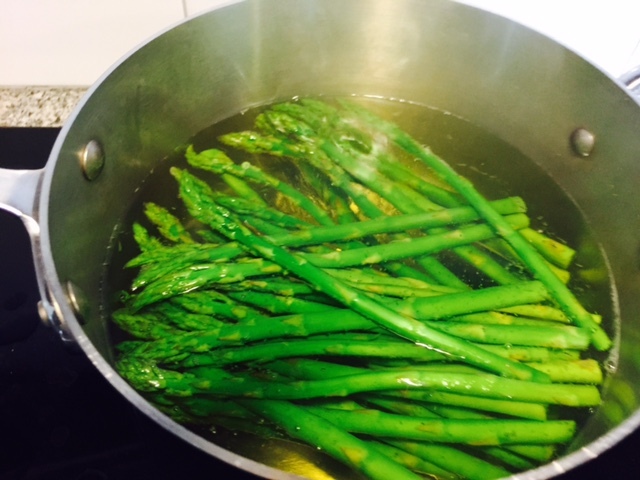 Next I started cooking asparagus for a vinaigrette salad (sorry no photo of the finished dish yet-update to follow. ) Finally there’s dessert. I haven’t even gotten started on that yet but it’s going to be an orange ginger cake. I guess you’ll have to check in for the finished dish updates after our early Easter dinner. Not sure I’ll get to it tonight. I’m already all “Peeped Out”. It’s Easter basket time again. Nestled with chocolate eggs and bunnies are those marshmallow chicks that have have become a nostalgic treat from one generation to the next. I looked up the company’s official website and learned that prior to 1954 it took 27 hours to produce a Peep by hand. 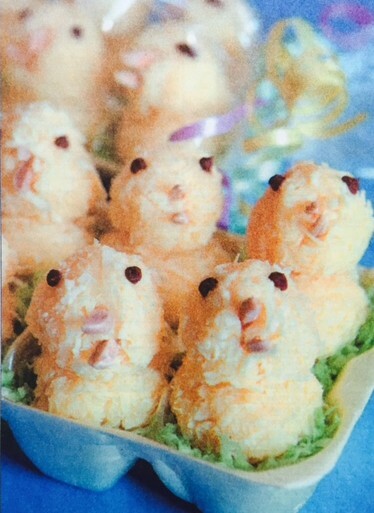 Now, it only takes 6 minutes to produce a mechanized Peep. 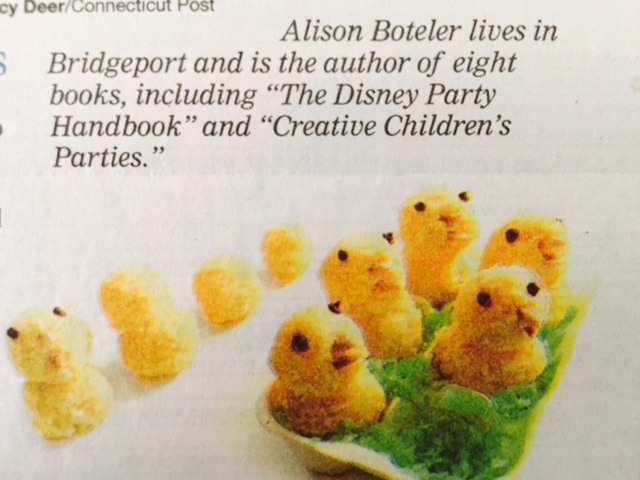 As a child, I was a fan of “petrified Peeps”. The process involved drying them on top of my dresser until they reached the perfect crunchy consistency (sometime in June). I used to think this was an acquired taste until I read that a preference for eating them stale was #6 on the company’s fun facts list. Now, if you think I’m about to tell you how to replicate marshmallow Peeps in your own kitchen, you’re going to be disappointed. Instead, I’m sharing with you a very different type of chicken candy that I invented when I was about ten years old. Mom used to make a coconut concoction with strawberry gelatin and shaped it into strawberries. One day I said “Lets use lemon gelatin”. However, the yellow strawberries were not well received. I reshaped the strawberries into little chicks and suddenly they were a hit with my family and friends. These are a fun project to make with your kids. Modeling the candy is kind of like working with marzipan only a lot less expensive. Nest them in egg cartons lined with tinted green coconut and they make great gifts. Combine gelatin, coconut, condensed milk and food coloring in mixing bowl Set aside 1/3 of mixture for heads. Mold remainder into 24 balls. Shape reserved mixture into 24 smaller balls fort heads. Press small balls firmly on top of larger balls. Insert two almonds into each head for “chirping” beaks and use chocolate minichips for eyes. 1 Tbs water mixed with two or three drops of green food coloring clear cellophane, ribbon. Tint coconut green by shaking in a large jar or plastic zipper bag with colored water. Spred on a tray and allow to air dry. If desired, you can cut cartons into half-dozen sections. Line individual egg carton cups with green coconut and set each chick in the a cup as if it were in a tiny nest. If giving as gifts, wrap cartons in cellophane and tie at each end with ribbon.